One of the most remarkable and novel discoveries in the last 400 years was electricity. We might ask, “Has electricity been around that long?” The answer is yes, and perhaps much longer, but its practical use has only been at our disposal since the mid to late 1800s, and in a limited way at first. One of the earliest public works gaining attention was enlightening the 1893 Chicago’s World Columbia Exposition with 250,000 light bulbs, and illuminating a bridge over the river Seine during the 1900 World Fair in Paris. The use of electricity may go back further. While constructing a railway in 1936 near Baghdad, workers uncovered what appeared to be a prehistoric battery, also known as the Parthian Battery. The object dates back to the Parthian period and is believed to be 2,000 years old. The battery consisted of a clay jar that was filled with a vinegar solution into which an iron rod surrounded by a copper cylinder was inserted. This device produced 1.1 to 2.0 volts of electricity. Figure 1 illustrates the Parthian Battery. Figure 1: Parthian Battery. A clay jar of a prehistoric battery holds an iron rod surrounded by a copper cylinder. 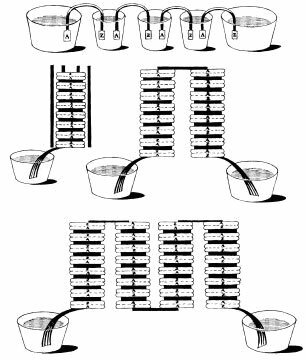 When filled with vinegar or electrolytic solution, the jar produces 1.1 to 2 volts. Not all scientists accept the Parthian Battery as a source of energy. It is possible that the device was used for electroplating, such as adding a layer of gold or other precious metals to a surface. The Egyptians are said to have electroplated antimony onto copper over 4,300 years ago. Archeological evidence suggests the Babylonians were the first to discover and employ a galvanic technique in the manufacturing of jewelry by using an electrolyte based on grape juice to gold plate stoneware. The Parthians, who ruled Baghdad (ca. 250 BC), may have used batteries to electroplate silver. One of the earliest methods to generate electricity in modern times was through creating a static charge. In 1660, Otto von Guericke constructed an electrical machine using a large sulfur globe which, when rubbed and turned, attracted feathers and small pieces of paper. Guericke was able to prove that the sparks generated were electrical in nature. The first practical use of static electricity was the “electric pistol,” which Alessandro Volta (1745–1827) invented. He thought of providing long-distance communications, albeit only one Boolean bit. An iron wire supported by wooden poles was to be strung from Como to Milan, Italy. At the receiving end, the wire would terminate in a jar filled with methane gas. To signal a coded event, an electrical spark would be sent by wire for the purpose of detonating the electric pistol. This communications link was never built. 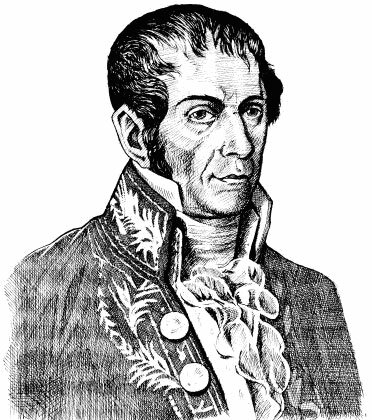 Figure 1-2 shows a pencil rendering of Alessandro Volta. 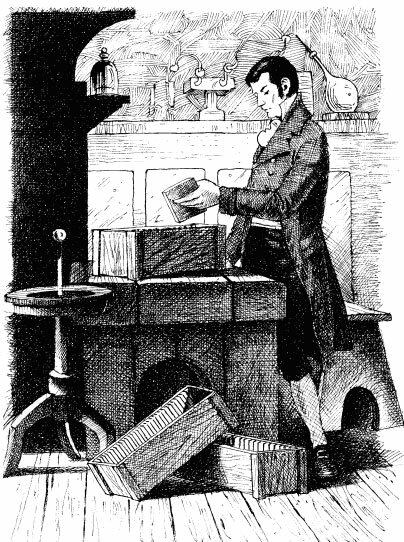 Volta’s discovery of the decomposition of water by an electrical current laid the foundation of electrochemistry. In 1791, while working at Bologna University, Luigi Galvani discovered that the muscle of a frog would contract when touched by a metallic object. This phenomenon became known as animal electricity. Prompted by these experiments, Volta initiated a series of experiments using zinc, lead, tin and iron as positive plates (cathode); and copper, silver, gold and graphite as negative plates (anode). The interest in galvanic electricity soon became widespread. Volta discovered in 1800 that certain fluids would generate a continuous flow of electrical power when used as a conductor. This discovery led to the invention of the first voltaic cell, more commonly known as the battery. Volta discovered further that the voltage would increase when voltaic cells were stacked on top of each other. Figure 3 illustrates such a serial connection. Metals in a battery have different electrical effects. Volta noticed that the voltage potential with dissimilar substances got stronger the farther apart they were from one another. The first number in the metals listed below is the affinity to attract electrons; the second is the standard potential from the first oxidation state. The metals determine the battery voltage; they were separated with moist paper soaked in salt water. 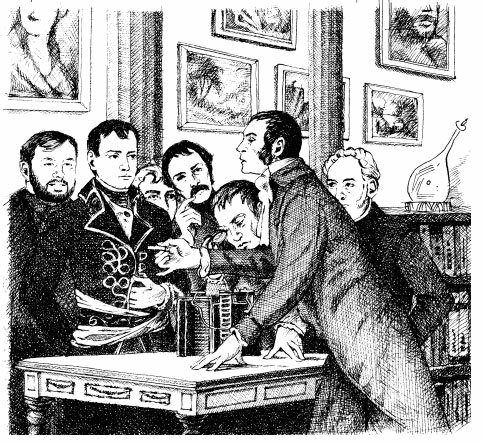 In the same year, Volta released his discovery of a continuous source of electricity to the Royal Society of London. No longer were experiments limited to a brief display of sparks that lasted a fraction of a second. An endless stream of electric current now seemed possible. France was one of the first nations to officially recognize Volta’s discoveries. This was during a time when France was approaching the height of scientific advancements and new ideas were welcomed with open arms, helping to support of the country’s political agenda. By invitation, Volta addressed the Institute of France in a series of lectures at which Napoleon Bonaparte was present as a member of the institute (see Figure 4). Volta’s discoveries so impressed the world that in November 1800 the French National Institute invited him to lectures at events in which Napoleon Bonaparte participated. Napoleon helped with the experiments, drawing sparks from the battery, melting a steel wire, discharging an electric pistol and decomposing water into its elements. In 1802, William Cruickshank designed the first electric battery for mass production. Cruickshank arranged square sheets of copper with equal-sized sheets sizes of zinc. These sheets were placed into a long rectangular wooden box and soldered together. Grooves in the box held the metal plates in position, and the sealed box was then filled with an electrolyte of brine, or a watered-down acid. This resembled the flooded battery that is still with us today. Figure 5 illustrates the battery workshop of Cruickshank. Figure 5: Cruickshank and the first flooded battery. William Cruickshank, an English chemist, built a battery of electric cells by joining zinc and copper plates in a wooden box filled with an electrolyte solution. This flooded design had the advantage of not drying out with use and provided more energy than Volta’s disc arrangement. In 1836, John F. Daniell, an English chemist, developed an improved battery that produced a steadier current than earlier devices. Until this time, all batteries were primary, meaning they could not be recharged. In 1859, the French physicist Gaston Planté invented the first rechargeable battery. It was based on lead acid, a system that is still used today. In 1899, Waldmar Jungner from Sweden invented the nickel-cadmium battery (NiCd), which used nickel for the positive electrode (cathode) and cadmium for the negative (anode). High material costs compared to lead acid limited its use and two years later, Thomas Edison produced an alternative design by replacing cadmium with iron. Low specific energy, poor performance at low temperature and high self-discharge limited the success of the nickel-iron battery. It was not until 1932 that Shlecht and Ackermann achieved higher load currents and improved the longevity of NiCd by inventing the sintered pole plate. In 1947, Georg Neumann succeeded in sealing the cell. For many years, NiCd was the only rechargeable battery for portable applications. In the 1990s, environmentalists in Europe became concerned about environmental contamination if NiCd were carelessly disposed; they began to restrict this chemistry and asked the consumer industry to switch to Nickel-metal-hydride (NiMH), an environmentally friendlier battery. NiMH is similar to NiCd, and many predict that NiMH will be the stepping-stone to the more enduring lithium-ion (Li-ion). Most research activities today revolve around improving lithium-based systems. Besides powering cellular phones, laptops, digital cameras, power tools and medical devices, Li-ion is also used for electric vehicles. The battery has a number of benefits, most notably its high specific energy, simple charging, low maintenance and being environmentally benign. The discovery of how to generate electricity through magnetism came relatively late. In 1820, André-Marie Ampère (1775–1836) noticed that wires carrying an electric current were at times attracted to and at other times repelled from one another. In 1831, Michael Faraday (1791–1867) demonstrated how a copper disc provided a constant flow of electricity while revolving in a strong magnetic field. Faraday, assisting Davy and his research team, succeeded in generating an endless electrical force as long as the movement between a coil and magnet continued. This led to the invention of the electric generator, and reversing the process enabled the electric motor. Shortly thereafter, transformers were developed that converted alternating current (AC) to any desired voltage. In 1833, Faraday established the foundation of electrochemistry on which Faraday’s law is based. Faraday’s law of induction relates to electromagnetism linked to transformers, inductors, and many types of electrical motors and generators. Once the relationship with magnetism was understood, large generators began producing a steady flow of electricity. Motors followed that enabled mechanical movement, and the Edison light bulb appeared to conquer darkness. After George Westinghouse lit up Chicago's World Columbian Exposition in 1893, Westinghouse built three large generators to transform energy from the Niagara Falls to electricity. The three-phase AC technology developed by Nikola Tesla enabled transmission lines to carry electric power over great distances. Electricity was thus made widely available to humanity to improve the quality of life. Figure 6: 250,000 light bulbs illuminate Chicago's World Columbian Exposition in 1893. The success of the electric light led to building three large hydro generators at Niagara Falls. The invention of the electronic vacuum tube in the early 1900s formed the significant next step towards high technology, enabling frequency oscillators, signal amplifications and digital switching. This led to radio broadcasting in the 1920s and the first digital computer, called ENIAC, in 1946. The discovery of the transistor in 1947 paved the way for the arrival of the integrated circuit 10 years later, and the microprocessor ushered in the Information Age, forever changing the way we live and work. Humanity depends on electricity, and with increased mobility people have gravitated more and more towards portable power — first for wheeled applications, then portability and finally wearable use. As awkward and unreliable as the early batteries may have been, future generations may look at today’s technologies as nothing more than clumsy experiments.